The World Canals Conference is the opportunity to bring together hundreds of canal enthusiasts, professionals and scholars from around the world, to exchange good practices on canals, including the protection of historic canals or features, revitalization of canal systems, harbour sites, canal trails and amenities; the presentation or interpretation of canals and corridors – their history and various elements; canals as a means to promote tourism, spur economic development and urban renewal. The conference is also an opportunity for the sponsoring canal or organization to showcase their achievements including the history of their Canal System, celebrate recent economic development within its corridor, highlight continuing efforts to revitalize their legendary waterway and their efforts to protect and tell the story of the canal to ensure continued existence and heritage value, along with the technical and operational challenges of operating and non- operating canals. This conference is unique in that it brings together at one time and in one location, all of the enthusiasts, scholars and professionals to talk about canals and their many facets. The World Canals Conference offers seminars and exhibits to participants on everything from how to interpret a canal site or trail, to the engineering and technical challenges of reopening or maintaining a canal. Recent presentations have included consultant experience for new initiatives, the advantages of turning towpaths in to trails, taking a canal from being the back door of a community to becoming the front door, dealing with masonry structures, and interpretive techniques. 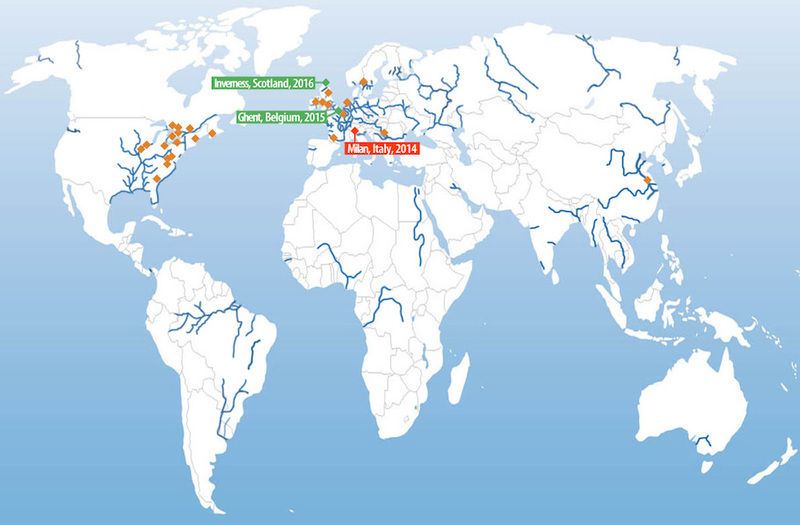 The World Canals Conference works in principle on a three year cycle Europe – Asia – the Americas. The more frequent hosting in Europe in recent years means that priority will be given to candidates from the other continents. auspices of Inland Waterways International.